The average American spends 90% of their time indoors. Like it or not, we are constantly breathing conditioned air. And it turns out that indoor air is usually more polluted than outdoor air because stagnant air can accumulate dust and other toxins much more quickly. A smart air purifier cleans your air just like a normal air purifier, but also gives you real time feedback and control of your air purifier and your indoor environment. Maybe you already know exactly what you’re looking for. But, in case you don’t, here’s a few important questions to ask that will help you choose a purifier that works for you. 1. How Big Of A Purifier Do I Need? The size of the area you wish to filter will have a big impact on how much you need to spend on an air purifier. You don’t want to buy a unit and find that it can’t handle the job. But, there’s no sense spending extra money to get extra capacity that you won’t need. Manufacturers usually list the unit’s coverage area by how much square footage it can effectively purify. However, Square footage isn’t always the best way to determine the proper sizing. Since air is a volume and not an area, you have to factor in the height of the ceiling. You also have to consider how many air changes per hour (ACH) you would like. Most square footage calculations you see advertised assume a ceiling height of 8 feet and an ACH of 2. These are reasonable assumptions, so I think for most people the advertised coverage area is a good estimate. However, if you are an allergy sufferer, you might consider up-sizing your air purifier so that you can achieve an ACH of 4. There’s no strict standards for ACH, but ASHRAE recommends an ACH of 4 for patient rooms in hospitals, which I suppose is a good reference point for your home. Instead of using square footage, the most accurate way to compare air purifiers is to use the clean air delivery rate (CADR). It is the volume of air the unit can purify per minute. It should be listed in cubic feet per minute (cfm). If you can’t find it on the main sales page, you should be able to find it listed on the specifications sheet. 2. How Loud Is It? In order to be most effective, these machines will have to be running while you’re in the room. So, in order to not be a nuisance, sound output should be at a minimum. Generally, most of the noise is caused by fast moving air. In order to make a quiet machine, the machine needs to be large so air velocity is lower. It’s also a good idea to keep your filters clean. Clogged filters will cause the fan motor to work harder and the air to move faster. The end result will be a louder air purifier. 3. Why Do I Need A “Smart” Air Purifier? I admit, an air purifier is not the first thing I think of when I think of “brilliant use cases” for smart home technology. If none of these features do much for you, you might be better off saving a little money and going for a lower cost, non-smart version. 4. Is It Also An Air Quality Monitor? Some of the models also have built in air quality monitors. This allows them to automatically adjust their filtration speed to adapt to changing air conditions. For example, you kick up a bunch of dust while vacuuming. Then, the purifier senses the extra dust and turns up its fan to clear the air of the extra dust as fast as possible. It’s important to remember that the air quality sensors aren’t meant to hold up to scientific scrutiny. Precise, accurate measurements of air quality require sensors that are much more expensive. The sensors in these machines work well enough to give you an idea of what’s going on with your air. They are still priced low enough and last long enough to be practical in your home air purifier. 5. What Contaminants Will It Remove From My Air? The effectiveness of contaminant removal depends on the filter technology used. Contaminates can be broken down into two categories. 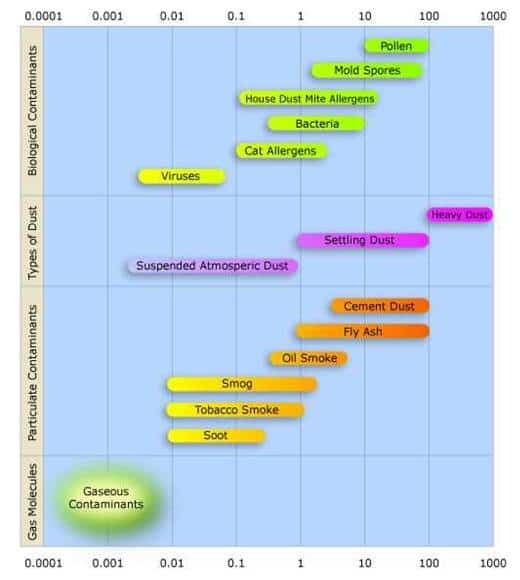 Particulates – Particles which are suspended in the air such as dust, mold, pollen, viruses. Particulates can be categorized further by their size (see image below), which is usually reported in µm (micrometers). VOCs (volatile organic compounds) – Chemicals which have been released into the air through combustion or evaporation. Unlike particulates, they exist in gas form, so they will not settle out of the air. Examples include fumes from paint or fumes from cleaning solvents. The separate types of contaminates require separate types of filters. HEPA Filter – HEPA filters are highly effective against particulates. They collect nearly 100% of all particulates below 0.1 µm and above 0.7 µm. However, even the best HEPA filters will have no effect on VOCs. Carbon Filter – The most widely used filter against VOCs. Activated carbon filters have microscopic cavities that chemically trap the highly reactive VOCs. However, carbon filters in home air purifiers are often hopelessly undersized and therefore prone to losing their effectiveness too quickly. ESP (electrostatic precipitator) – An ESP is used for particulate collection. It uses electricity to charge incoming particles. Then, they pass through oppositely charged plates. The charged particles are attracted to the opposite charge of the plates and collect on the plates. The advantage of an ESP is that you won’t ever have to buy an expensive replacement filter. Instead, you will just need to periodically wash the plates. PCO (photocatalytic oxidation) – Uses UV light combined with a catalyst to chemically destroy VOCs and microorganisms. There’s an interesting discussion here about how PCO’s work. UVGI (ultraviolet germicidal irradiation) – UVGI uses ultraviolet light to kill microorganisms. It’s most effectively used in conjunction with an effective particle collector (HEPA or ESP). 6. How Much Maintenance Will It Require? You wouldn’t buy an expensive car and never change the oil, right? At some point, all filters need to be either cleaned or replaced. Buying a more expensive purifier will not eliminate the need for filter maintenance. Find out how often the filters need to be replaced or cleaned and how much they cost. There’s no sense spending money on a nice air purifier if you don’t plan on doing the required maintenance to keep it performing at a high level. I searched the web for every WiFi air purifier I could find and here’s what I found. A few of the models (Airmega, Blueair, Philips, GermGuardian) have multiple sizes. I chose to list the model number for the largest of each. I’ve done a bunch of research on these air purifiers and I came to the conclusion that the Airmega400S is the Cadillac of air purifiers. 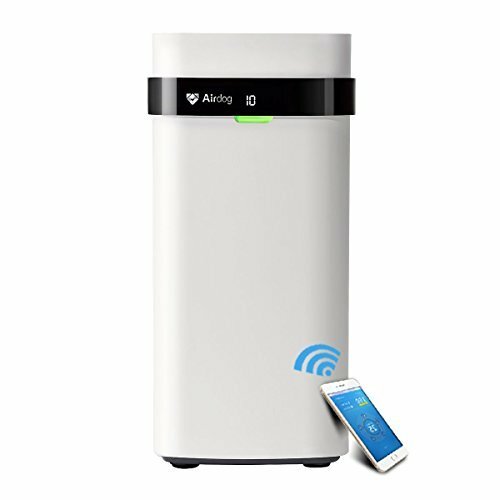 Airmega is made by Coway, which is a well-respected manufacturer of air purifiers. Wirecutter agrees as two of their top 3 air purifiers are made by Coway. The Airmega is equipped with two large Max2 filters which are combination HEPA and activated carbon. It’s easy to get seduced by the fancy new filter technology on other models. But in my opinion, a good, old fashioned HEPA filter is still a great defense against common household contaminants. Like most consumer air purifiers, the carbon layer of the filter is too thin to be effective against large-scale VOCs. But, it should be able to reduce the occasional household odor. On one hand, it would be nice to have separate carbon filters so they could be replaced as needed. But, on the other hand it’s more convenient to only need to buy and replace one set of filters at a time. You can use the app to control your purifier from anywhere. Better yet, you can setup a schedule, so it gets controlled automatically. And, for those off-schedule moments, it also has voice control with Alexa. It also includes an air quality monitor which is reported in real-time on the app. You can set the purifier to smart mode so that the fan speed automatically increases if the air quality worsens. If you want to keep the Airmega in top operating condition, you’ll have to replace the two big filters about once per year. It’s also a good idea to clean the prefilters and the air quality sensor regularly. If the Airmega is the Cadillac of air purifiers, the Molekule is the Lamborghini. It comes in a smaller, lighter package, but it’s packed with cutting edge air filter technology and boasts a sleek modern look. It’s also equipped with a high-end price tag. The key to Molekule’s effectiveness against allergens is its use of a proprietary PCO-like process. It’s important to realize that not all PCO technology is made equal. Different combinations of catalysts and UV light can cause different results. The Molekule uses a process they call photo electrochemical oxidation (PECO). PECO is described by its inventor as an evolution of the PCO process. So, it’s like PCO, but better. The inventor, Dr. Yogi Goswami, is one of the original pioneers of PCO and has been working on the problem of indoor air pollution for over 20 years. 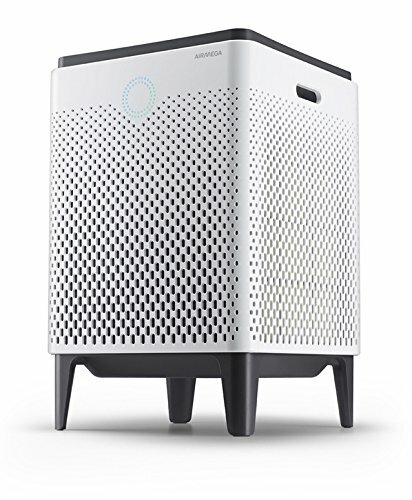 Julian Perry of the-gadgeteer.com is a long time allergy sufferer and calls Molekule “the best air purifier that I have ever tried”. The listed CADR of Molekule (85cfm) is relatively low compared to its competitors. But the CADR number is a little misleading. Molekule ejects pollution neutralizing molecules into the air as part of the normal operation of the PECO process. Those molecules float around the room until they run into some VOCs to neutralize. So in that sense, Molekule can actually clean air that doesn’t ever pass through the machine. But, if your main concern is large particles such as dust and pollen, those still need to pass through the machine to be removed by the HEPA filter. 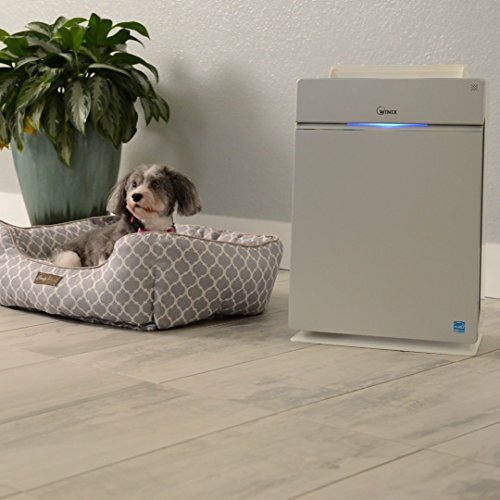 The Airdog X5 has a unique and highly effective method for collecting particulate pollution in your home. It’s main system is known as an electrostatic precipitator (ESP). Incoming air is passed through a charged field and any tiny particles in the air get charged. The air is then directed through a grid of oppositely charged plates. The particles get attracted by the opposite charge and stick to the plates. The plates are removeable and washable, which means you won’t have to spend money on replacing expensive HEPA filters. Depending on how dirty your air is, you’ll probably need to clean the plates every 2-4 weeks. While the ESP is great at particle collection, it does nothing for VOCs. The final filter stage of the Airdog is a composite catalyst filter. It’s purpose is to reduce ozone and neutralize VOCs. This filter will degrade over time and eventually need to be replaced. It also includes an air quality monitor so you can view the air cleaning progress in real time. The Airdog’s app is fairly basic but works as intended. You can use it to control the purifier from anywhere, monitor your home’s air quality history and receive maintenance reminders. It’s still a pretty new product, so maybe there will be more smart home integrations in the future. The Airdog X5 is priced similarly to the other high-end purifiers. It has a comparable CADR (200cfm) and operates quietly and efficiently. Where Airdog really beats the competition is in maintenance cost. Other models require spending $100-$200+ on filters per year. The only extra cost for Airdog’s filter plates is the time it takes to clean them. 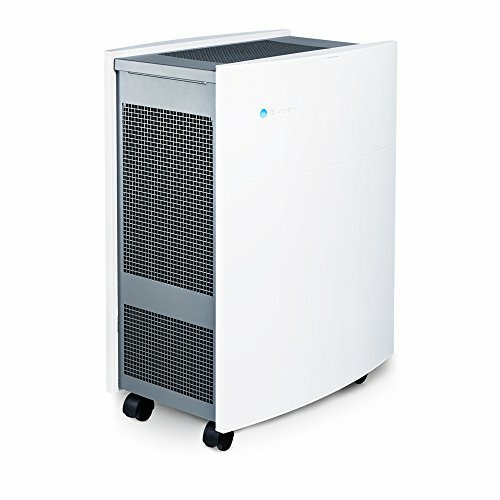 The Blueair Classic 605 makes quick work of most air cleaning tasks. Blueair’s HEPAsilent technology uses an ion generator which causes particles to cling to the HEPA filter more effectively than a standard HEPA filter. This allows them to make their HEPAsilent filter less dense than a standard filter. The less dense filter lets air pass through more easily and quietly. The HEPAsilent filters make the Blueair 605 a beast when it comes to CADR. It has the highest CADR of the models on my list. It can clean more than 40% more air than the Airmega. Cleaning all that air comes at a cost of more frequent filter replacement. Blueair recommends replacing the filters every 6 months. You can use the “stock” filters which are just HEPA filters or you can upgrade to the SmokeStop filters which incorporate an extra activated carbon layer for odor removal. The Blueair app gives you remote control of the air purifier, let’s you set a schedule, and alerts you of any required maintenance. It also supports voice control using Alexa and has IFTTT support. The Blueair lacks a built-in air quality sensor. However, they do sell a smart air quality monitor called the Blueair Aware. The purifier will integrate with the Blueair Aware and use the air quality feedback to adjust its fan speed when needed. I know good looks are a judgement call, but to me the Blueair Classic units remind me of my old steel desktop computer cases. I definitely prefer the look of the Airmega. But, if you’re looking for something that will do a better job of blending in, the Blueair fits the bill. 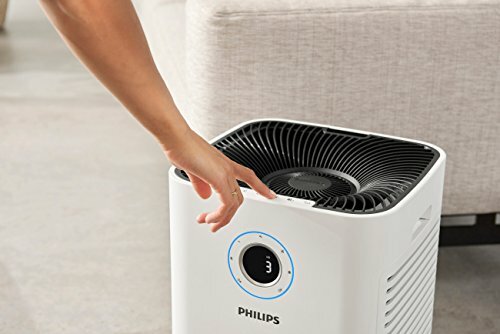 The Philips Air 5000i purifier includes a set of high-quality air quality sensors. They call their sensing system, AeraSense. Like many other purifiers with sensors, this allows it to automatically increase the fan speed when necessary. The 5000i is the largest model in the series, with a total of 6 filters. There’s two washable pre-filters, two active carbon filters and two HEPA filters. You can use the nicely designed Air Matters app to control and monitor the purifier from anywhere, but that’s about it. You can’t even set it run on a schedule. However, you can control it with Alexa, so I guess you could setup an Alexa routine for scheduling purposes. It’s a decent all around purifier but nothing about it really stands out against the competition. It is one of the most expensive on our list, so your money would probably be better spent elsewhere. However, the 1000i model, which is made for bedrooms, is much more cost effective and might be worth a look. This GermGuardian model is advertised as a 4 in 1 model. The 4 stages of filtration are pre-filter, activated carbon, HEPA, and a UV-C sanitizer. The pre-filter and HEPA filter are standard filters and do the bulk of the effective filtering. The thin activated carbon filter is pretty much a gimmick, but that’s typical with home air purifiers in this price range. You should get a couple weeks of odor reduction out of it, but good luck beyond that. They are fairly cheap so it might be worth buying a couple and keeping them on hand in case you have an odor emergency (although I’m not exactly sure what an odor emergency would be). The UV-C sanitizer is supposed to kill pathogens that are exposed to it’s light. It certainly kills some, which is better than none I guess. But again, the feature is mostly a gimmick. Air passes through the UV light much too quickly to consistently kill microorganisms. 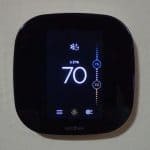 It includes a basic air quality sensor which allows an auto mode to adjust fan speed and optimize the room’s air quality. 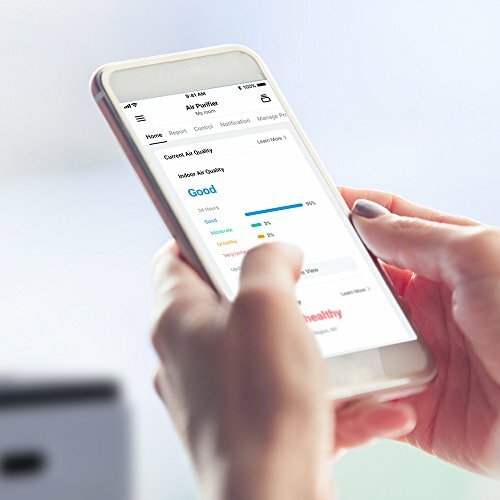 The Guardian app gives you the ability to remotely control the purifier, view the air quality history, and receive maintenance notifications. You can also turn the UV light function on/off. Unfortunately, there’s no scheduling option. The GermGuardian purifier is ready for voice control. It supports Alexa and is the only purifier I found that supports Google Assistant. The marketing buzzword for the Winix HR1000 is PlasmaWave technology. This technology uses UV light to create molecules known as hydroxyls. The hydroxyls react with and neutralize mold, bacteria, VOCs, etc. It includes Smart Sensors for air quality monitoring. And, like most of the competition, it includes the ability to automatically adjust fan speed to make sure your air stays clean. The unit also displays an indication of the air quality on a scale of 1-3. The Winix Smart app gives you control from anywhere, access to real-time air quality information (both indoor and outdoor), and receive maintenance alerts. You can also set a schedule to make sure the fans stay quiet while you sleep. The LED lights will dim automatically when it gets dark. However, the PlasmaWave feature gives off light, too. You can use the app to manually turn it on/off, but it would be nice if it could be scheduled. The HR1000 offers a respectable CADR of 258 cfm, which is great considering its low cost compared to other models with similar CADR. In all, the Winix HR1000 is a good value for any medium sized room. It kind of seems like WiFi on an air purifier is an experiment right now. Manufacturers are trying it out to see if it’s something that is useful and consumers actually want. For now, the apps are primitive and the smart home integrations are minimal. However, if you buy a purifier with the WiFi hardware already installed, you’ll be able to easily receive updates as these features and integrations are developed.